No it is time to stand up and do something against war, anti-democraty, racism. For our rights and that we are all humans. Ok, it is not the latest work, nevermind a nice work. It was an overnight editing. Cameraman was Peter from Tencam. It was a job for Neumann & Müller ICS, the agency OVATION for the company PTC. His pics were great, he collected unusual pics and the standard like outside, people talking and so on. I worked with the Creative Director Amanda together. It is great if you realize you have the same thinking about edits, pics and the best is when you work as a team. I started with the edit than Amanda joined me and we finished the short clip. She and her boss are very suprised that the client has only one single change. Normaly there a much more changes and every of the company people have to say something. 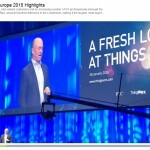 here the link on the PTC LiveWorx Europe website.